WHEN BINYAMIN NETANYAHU, Israel’s prime minister, called an election in December, he seemed set for a fourth straight electoral victory. He hoped success would allow him to beat David Ben Gurion’s record as Israel’s longest-serving prime minister; more important, he hoped to resist calls to step down if, as seems likely, he is indicted on charges of corruption and breach of trust. A last-minute merger of two centrist parties, ahead of the deadline to submit party lists on February 22nd, has blown the race wide open. In response, the prime minister is already resorting to desperate measures in order to rally his base. 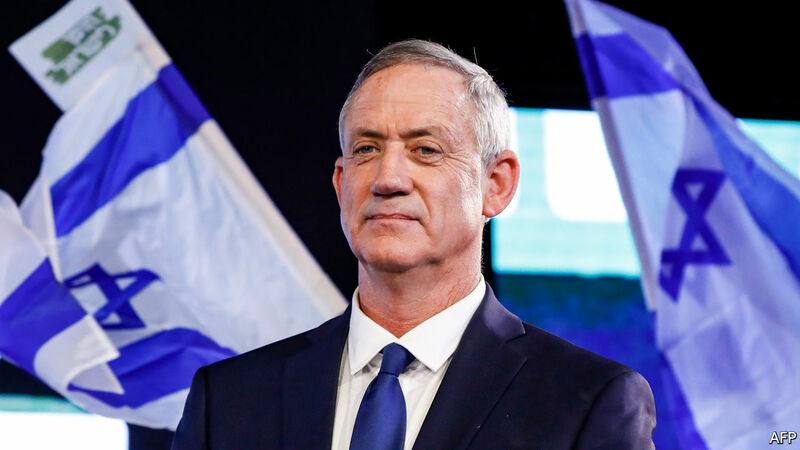 Israel Resilience, a party formed only two months ago by Benny Gantz (pictured), a former army chief of staff, has joined forces with Yesh Atid, a centrist party founded in 2012 by Yair Lapid, a former television personality. Neither leader wanted to serve as number two. But Mr Gantz’s party has been soaring in the polls; Mr Lapid grudgingly agreed to take the second spot in return for a promise that, should they win the election, he will replace Mr Gantz as prime minister in two-and-a-half years. The merged party will be called Blue and White after the colours of Israel’s flag. It has a distinctly militaristic air, with three former army chiefs among its candidates. The party hopes that will bolster its appeal to right-wing voters concerned about security. Other candidates on its list come from the left. Yet its policies are intentionally vague. It is less a coherent political party and more a vehicle aimed at preventing Mr Netanyahu from winning a fifth term. Polls carried out since the two parties’ merger show Blue and White getting 30% of the vote, leading Mr Netanyahu’s Likud party by about five points. This is the first time that a party other than Likud has led the polls since 2015, during the campaign for the last general election. That said, Mr Netanyahu’s coalition of right-wing and religious parties still commands the support of a small majority of voters. As things stand Mr Gantz would struggle to form a centre-left coalition government even if he came out on top. Much can change before election day on April 9th. Likud trailed behind Zionist Union, then the main opposition party, for much of the run-up to the last election. But in the final days of the campaign Mr Netanyahu sought to whip up hard-right voters; as Israelis cast their ballots, he warned that “Arab voters are heading to the polling stations in droves” and urged Jews to turn out. He won. He has also shored up support for his coalition from the farthest extremes of the political system. Under intense pressure from Mr Netanyahu, Jewish Home, a religious-nationalist party allied with Likud, agreed to include in its candidates list representatives of the racist-supremacist Jewish Power party. This union helps to ensure that the two parties will reach the minimum threshold of 3.25% of the vote required to take seats in the Knesset, thus avoiding the risk of “wasting” right-wing votes. Jewish Power calls for the annexation of the occupied territories and encouraging’ the emigration of all Arabs. It had until very recently been regarded as beyond the pale in Israeli politics. It is descended from the Kach Party, outlawed by the Israeli government as a terrorist organisation in 1994, after one of its members murdered 29 Muslims at prayer in Hebron. Kach’s American-born founder, Rabbi Meir Kahane, had been a Knesset member in the 1980s. He was assassinated in New York in 1990. Whenever he spoke in the Knesset, the entire plenum, including all Likud members, would leave in protest at his racist policies. Mr Netanyahu has, in effect, legitimised Rabbi Kahane’s followers to protect his majority. Mr Netanyahu may not survive for long in any case. Israel’s attorney-general is expected to announce indictments against the prime minister within days. It is too early to predict whether such a move would cost him votes, or help him rally supporters who believe he is the victim of a witch-hunt orchestrated by a leftist “deep state”. Mr Netanyahu denies the charges and vows not to resign. But even if he wins the election, he will find it increasingly difficult to cling to power; with a trial looming his allies may soon abandon him.